Happy Easter everyone, if chocolate is your thing I hope you've done well this weekend. I spent my Easter Saturday with friends at Patonga, the most southern beach on the NSW Central Coast, and about a one hour drive from my home, also on the Central Coast. My friends' house can only be reached by water so after a wonderful and very long lunch we chugged back to the beach in their small boat so I could return to Wamberal. This was the beginning of the sunset. Last post I showed photos of my "new" 19th century photo album (see here) and Mo asked me to show some more pics to demonstrate the binding. 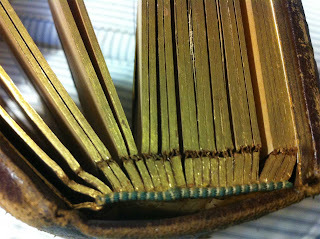 The binding is brown leather with blind and gold tooling and all edges are gilt. The pages are on stubs and I think the best way to explain that is to show a photo. If you click on the photo you should be able to see that each page joins the stub by two pieces of book cloth which is also used as the hinge between the end papers. You can also see the glued on head bands in this photo. I'm not much on explaining so I apologise in advance for a garbled description. If anyone has a web description of this binding I'd love to see it. Each page and stub is heavy cardboard (board) and is made up of a layer of white paper, the brown book cloth, the board, the brown book cloth, and then the white paper again. And that's just the joining to the stubs! The book cloth forms a very narrow hinge on the actual photo pages but forms the hinge and join between each pair of stubs, holding the spine together. I can't see any sewing so I imagine that glue, probably animal glue, keeps it all together. There is mull glued to the spine. I'm not keen on looking too closely in case it all falls apart. This is a photo of the white moire paper endpapers. You can see how the endpaper just covers the hinge material. Each page is joined in this same way. The photo pages are layers of heavy paper, then heavy board and more heavy paper. 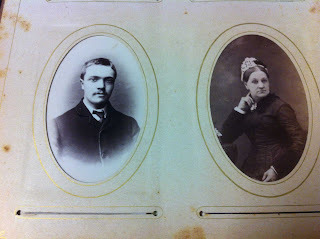 The paper has oval or rectangular openings to contain the photographs. 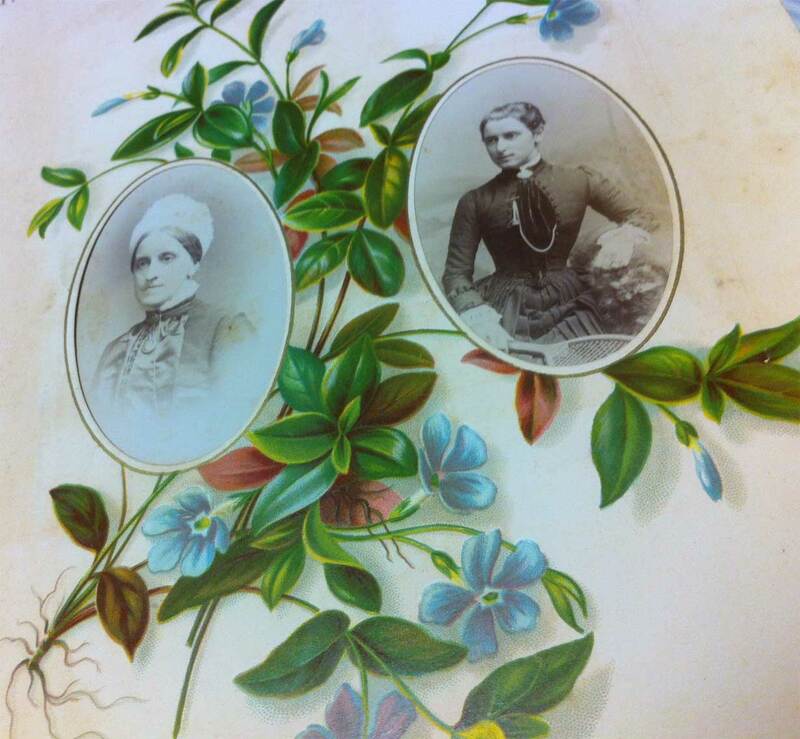 There are slits below the openings to allow the photographs to be inserted on both sides of the page. You can see on the left the silhouette of the full photograph. 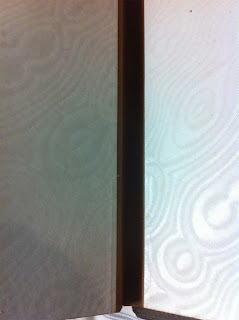 Just a point here: if you are ever making slits like this, first punch out a tiny circle at each end, the cut the slit. This helps prevent the slit from tearing at the ends. The decorated pages don't have slits but the photos are inserted through the corresponding slits on the reverse of the page. The illustrations are perhaps chromolithographs; I don't think they are hand coloured lithographs but I could be wrong. Any further ideas on this binding will be passed on with gratitude. Last weekend we had friends over for dinner by the fire ring and Sophia and I made naan bread to cook on the barbeque. I made the dough (from River Cottage Veg every Day) and after an impressive rising, Sophia punched it down and pulled and flattened it to go on the hot plate. It was good that evening and even better when the leftovers were re-grilled on the barbie the next morning for breakfast. My oven is (at long last) installed so I'm looking forward to making bread this winter. 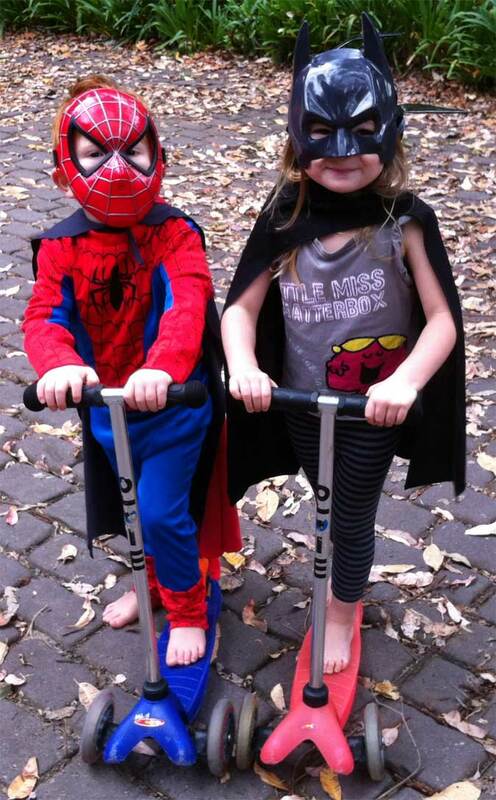 The Super Heroes were too busy to cook! After a trial of no word verification I think I must go back to it. The Anonymous comments are coming so thick and fast that I can barely keep up with them. Your Easter Saturday sounded like SUCH a treat. Thank you for more information about the wonderful photo album. As you know, book binding is out of my league, but I am endlessly curious - about everything. 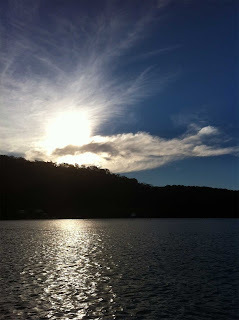 EC, it was a lot of fun, a fete AND messing about in boats! With dear friends. What more could I ask for? And I think you're subscribed to my blog via email. Happy Easter to you too Dear Carol! That lovely old photo album amazes me, and there couldn't have been a more worthy recipient than you! I don't know another person who would stop and carefully analyze and admire its construction as you have. Sophia is certainly a beauty! We love Nan, but I have never made it....and I'd never thought of cooking it on the grill. I will have to look for recipes here. 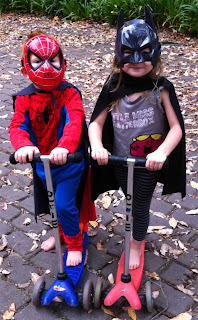 Also love the photo of your Super Heroes! Judy, I had a lovely weekend but it was very good to see the family drive back through the gates. Little dog Peggy was great company but we both missed the grand cherubs. Hi Sue, thanks for dropping in. I've now visited you and absolutely love your background illustration. I like your style. Ronnie, yes, Easter was good. Not sure what the next phase of the book will be but I'm keeping it out where I can see it for further inspiration. Wonderful photos of the album - what a lovely piece of work. I'm very impressed by the naan making too! Thanks, Mig, the album is lovely. We were impressed with the naan too, I hope it gives Fia a feeling for the joy of cooking. 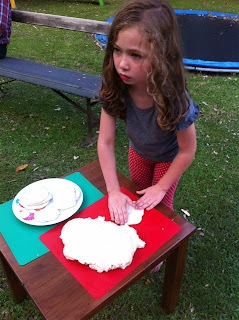 Certainly there was a lot of joy in getting her hands into the sticky dough! Hi Gail, it really is a pleasure to share something like that. I should do more sharing of my old books. oh that is a lovely bit of book construction, will have a look through my old bookbinding books and see if I can locate a diagram! Mo, I hoped you would see it. I'm sure one of us must have something about the construction in our various libraries of book binding books.